One theme that emerges from prior posts on this blog (do a search for "speed") is that "speed matters" when it comes to broadband networks, both fixed and mobile. Consequently, the recent announcement that Ericsson (click on the press release graphic to see a full size version) had achieved speeds of 5 Gbps throughput in a lab test made big news, especially here in Korea which prides itself on having the world's fastest and arguably most advanced broadband networks. 5G networks are expected to be about 1,000 times faster than existing LTE networks. 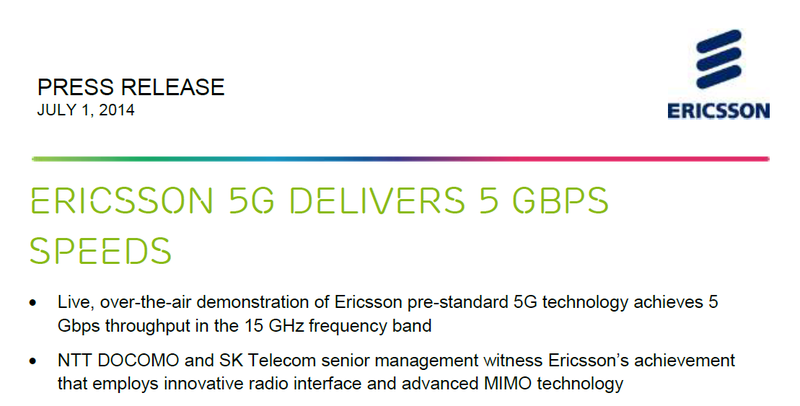 Today, as reported in The Korea Joongang Daily, SK Telecom announced that it had signed an agreement with Ericsson to jointly study future 5G networks. As noted in the article, "The companies will study the next generation Small Cell, ultra-wideband technology, ultra-low latency transmission technology, which lowers data transmission delay times to 1 millisecond, and FDD (Frequency-division duplexing) and TDD (Time-division duplexing) convergence technologies, which are essential for the evolution of 5G. In LTE and LTE-A services, the data transmission delay time is around 10 milliseconds." What the article did not stress is that Japan's NTT Docomo is also cooperating with Ericsson and that the laboratory demonstration was of "pre-standard 5G technology." For these next generation mobile networks, agreement on international standards will be a critical matter.